Last time round I mentioned that it had been fairly quiet! PH0006741/113 - WESTERN GREYHOUND LTD, WESTERN HOUSE, ST. AUSTELL STREET, SUMMERCOURT, NEWQUAY, TR8 5DR Cancellation Accepted: Operating between Bodmin (Mount Folly) and Liskeard given service number 593 effective from 03-May-2015. I believe there were more but events have overtaken the registrations. It is interesting that this section of the 593 is not being covered by anyone in the big route carve up so clearly can not be deemed worthwhile by anyone. An announcement was made by Cornwall Council this morning that the company is experiencing "operational issues". Driver Paul Wills told the Cornish Guardian he arrived for work at 5.30am this morning for his shift only to be told that the company will no longer cease to trade, and was handed a redundancy letter. Mr Wills said the letter explained to staff that the directors had "many hurdles" to overcome since taking over Western Greyhound, including an issue with fleet insurance. He said they explained they have explored "all avenues" before making the decision to cease trading. DIRECTORS of Western Greyhound say they have spent the morning trying to ensure the majority of its staff will be swiftly re-employed – and confirmed the company has ceased trading due to a "financial issue" with its insurance. Mr Bishop, who only purchased the entire share capital of Western Greyhound in December from the previous owners, said he has explored all the alternatives to the situation, but without success. He held talks with several workers at the firm's depot in Summercourt this morning. Mr Bishop said he could not comment on matters relating to the previous owners - Mark Howarth, his wife Mari and Robin Orbell – but did say that the past is "related" to the sudden decision to cease trading. Mr Bishop also declined to comment on issues relating to the repayment of creditors. It has to be said that Cornwall County Council has worked brilliantly well with other operators to ensure as much of the WG network is covered. Details of the new arrangements are listed under the new operators below. A council spokesperson said: "Four companies have agreed to provide the majority of services from Monday and so it is hoped that, for the main part, disruption to the general public will be kept to a minimum. " There will still be some former Western Greyhound buses on the road, from Monday onwards, but they will not be operated by Western Greyhound." All Real Time Passenger Information signs (RTPI) have been switched off to avoid confusion while the service timetables are being updated. As I type this none of the new Cornish network has appeared on the public VOSA site. Its often a few days behind events so I guess we will start seeing them later this week. Rather than wait a full two weeks for Cornwall Transit 007, I will post an extra Cornwall Transit 006A later in the week to cover all the new services in more detail. This afternoon, following agreement with Cornwall Council to step in, we can confirm we anticipate well run some form of replacement bus service from Monday, following the cessation of Western Greyhounds services today. We are currently working on driver duties, schedules and timetables and we are sure you will appreciate this takes time. As well as working on these they also need to have them approved by the Regulators and Cornwall Council before we can publish and implement. Again this takes time. There may be some minor amends to services/timetables so we ask all passengers to check the timetables closely. We will endeavour to publish timetables on our website and social media feeds as soon as we are able over this weekend. We expect to have everything available by Monday morning. Timetables at the bus stops will also be updated as soon as we can, however, again, we ask passengers to appreciate this is a lengthy process too. We will also try to have printed timetables in our travel shops early next week. First Kernow has taken 10 WG leased vehicles from Ensign 5 Dennis Dart MPD and 5 Optare Solos with further spare first stock from around the country also expected. So far identified as with First are Darts 201 NA52AWF 205 NA52AWN 206 NA52AWO all green, along with white KN52NFU. Optare Solo 956 WK56PEN , 817 WK55BUS. 914 PL06TFX, 816 K50WGH. Other buses are being sourced from within First Group, but also a batch of ex Lothian Dennis Darts are coming from Ensign with SK52OKF being confirmed so far. ©Nick Rice (cc) - another superb shot from Nick! • Penzance – Gwavas: Adult single was £3, now £2. Adult return was £4.50, now £3. • Helston – Breage: Adult single was £5 now £3. Adult return was £7.50, now £4.50. • St Ives – St Erth Station: Adult single was £3, now £2. Adult return was £4.50, now £3. • St Ives – Lelant: Adult single was £3, now £2. Adult return was £4.50, now £3. • Redruth – Truro: Adult single was £5, now £4. Adult return was £7.50, now £6. • Truro Bus Station – Truro Railway Station: Adult single was £2 now £1. Adult return was £3, now £1.50. • Zennor – St Ives: Adult single was £4, now £3. Adult return was £6, now £4.50. • Penzance – Loggans Way: Adult single was £5, now £4. Adult return was £7.50, now £6. • Penzance – Hayle Retail Park : Adult single was £5, now £4. Adult return was £7.50, now £6. • Crowlas – Whitecross: Adult single was £3, now £2. Adult return was £4.50, now £3. • Truro – Tresillian: Adult single was £3, now £2. Adult return was £4.50, now £3. • Falmouth – Conway Road: Adult single was £3, now £2. Adult return was £4.50, now £3. • Falmouth - Union Corner: Adult single was £3, now £2. Adult return was £4.50, now £3. • Culdrose - Helston Sainsbury’s: Adult single was £3, now £2. Adult return was £4.50, now £3. • Culdrose - Helston Tesco: Adult single was £3, now £2. Adult return was £4.50, now £3. • Camborne – Tolvaddon: Adult single was £3, now £2. Adult return was £4.50, now £3. 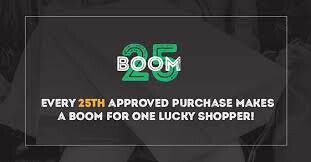 • Troon – Camborne: Adult single was £3, now £2. Adult return was £4.50, now £3. • Camborne – Pool Health Centre: Adult single was £3, now £2. Adult return was £4.50, now £3. • Truro – Penryn: Adult single was £5, now £4. Adult return was £7.50, now £6. • Newquay – Truro: Adult single was £4, now £3. Adult return was £6, now £4.50. • Perran Sands – Perranporth: Adult single was £2, now £1. Adult return was £3, now £1.50. • Across Truro from Newquay to Playing Place, Carnon Downs, Devoran, Penryn and Falmouth. • Route 21: transfer fares are now available across St.Austell to The Eden Project, St.Blazey, Par, Fowey and Mevagissey. Of course some saw this as another attack on Western Greyhound but to be fair to First many of these discounted fares are on routes which did not compete with WG. 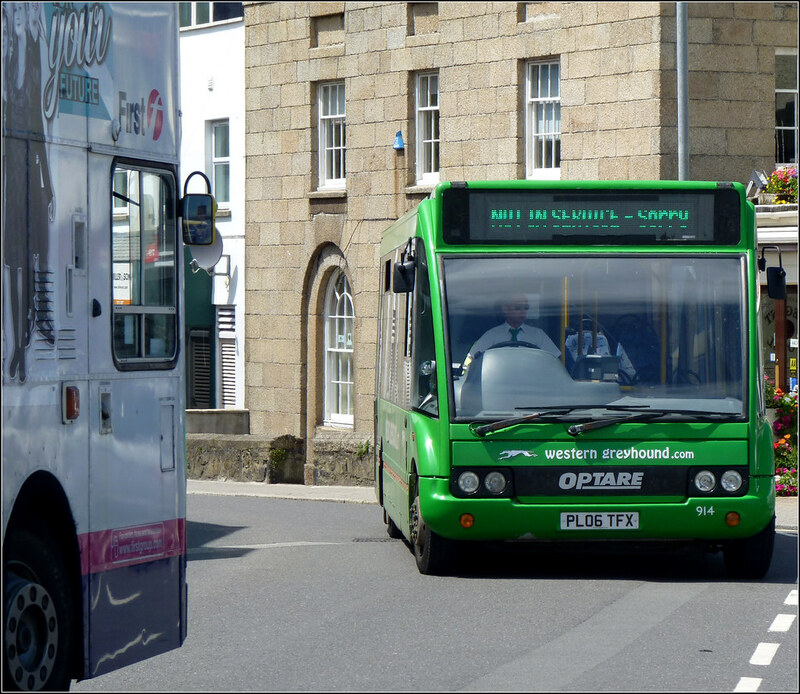 Following the cessation of trading of Western Greyhound we will be running a new service between Liskeard and Padstow. 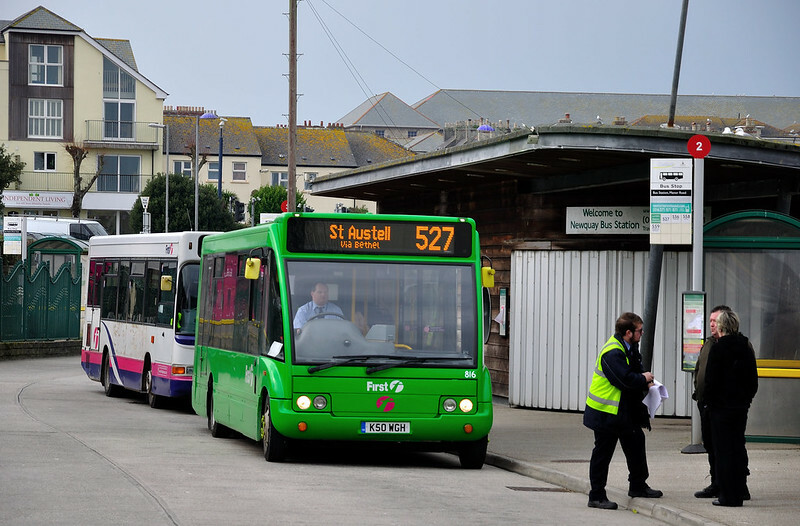 From Monday 16th March a new route, service 75 (previously Western Greyhound route 555) will operate hourly between Liskeard and Padstow via Bodmin and Wadebridge. We will be accepting all existing Western Greyhound passes until the end of March. We are working on getting fares for this route on our ticket machines for Monday morning. Please note all routes that were taken over to form Go Cornwall Bus on the just 3 months ago remain unchanged, but will now see the addition of service 75. To help cover the additional work (along with other commitments coming up) Citybus have purchased several buses from Brighton with two Darts already prepared for the new 75 service. The remaining buses are Dennis Tridents, but these will remain in Plymouth which in turn will release more buses for the Go Cornwall network. Quite a few buses have had the new 75 service programmed on to their destination equipment so buses will be able to display their full destination from day one. PH1033087/6 - MOON & BENNEY LTD T/A GROUP TRAVEL, ENTERPRISE PARK, MIDWAY ROAD, BODMIN, PL31 2FQ Cancellation Accepted: Operating between Camelford and Trago Mills given service number 227 effective from 23-Apr-2015. PH1033087/9 - MOON & BENNEY LTD T/A GROUP TRAVEL, ENTERPRISE PARK, MIDWAY ROAD, BODMIN, PL31 2FQ Cancellation Accepted: Operating between Port Isaac and Trago Mills given service number 226 effective from 23-Apr-2015. PH1053866/21 ST. IVES BUS CO. LTD, 4 ROSEWALL TERRACE, ST. IVES, TR26 1QJ Registration Accepted Starting Point: St Ives, Royal Square Finish Point: St Ives, Royal Square Via: Trenwith Car Park, St Ives Rugby Club, Ayr Holiday Park Service Number: 5 Service Type: Normal Stopping/Hail & Ride Effective Date: 28-MAR-2015 Other Details: Daily service from 28/3/2015 until 03/10/2015. Continuous registration starting from the Saturday of the school Easter holidays (or Good Friday if that is the start of the holiday) through to the first Sunday of October. PH1053866/22 ST. IVES BUS CO. LTD, 4 ROSEWALL TERRACE, ST. IVES, TR26 1QJ Registration Accepted Starting Point: St Ives Rugby Club Finish Point: St Ives, Porthleor Beach Via: Ayr Holiday Park Service Number: 6 Service Type: Normal Stopping/Hail & Ride Effective Date: 28-MAR-2015 Other Details: Saturday 28 March 2015 to Sunday 12 April 2015. Saturday 23 May 2015 to Sunday 27 September 2015. Continuous registration for the school Easter holidays and from the Saturday before Spring Bank Holiday through to the last Sunday in September. PH1011427/51 - SUMMERCOURT TRAVEL LTD T/A TRAVEL CORNWALL, THE OLD COACH GARAGE, ST. AUSTELL STREET, SUMMERCOURT, NEWQUAY, TR8 5DR Cancellation Accepted: Operating between Summercourt and Bude given service number 460 effective from 04-May-2015. Service Number: 460B Service Type: Normal Stopping/Hail & Ride Effective Date: 04-MAY-2015 Other Details: Monday to Saturday. Well thats all for now, but as I mentioned above there will be a 6A later in the week we we can take a closer look at all of these new routes to replace WG. Plus the extra route off the table - First 30 St Austell Local covering missing roads mainly from the 527 not going to the Eden project. And the confusion that the 594 is replaced by the 94 BUT it goes to NEWQUAY and not Truro from Wadebridge. Re fleet news above "First Kernow has taken 10 WG leased vehicles from Ensign" is there any more background to this as it could be open to more than one interpretation eg did WG never own these 12 year old vehicles ? Did Ensign buy them back last week & loan them to First as a stop gap ? Apparently they were not owned by WG the company but by an individual/s Ensign bought them and they went straight to First on hire from Ensign. Indeed, they were collected by First straight from Summercourt. Another 3 MPDs were added to the same arrangement yesterday. From what I have been told the buses were all sold to Ensign Bus the week before it folded so it would appear a desperate last ditch effort to get cash. These were then leased back. It is correct at least one of the buses that passed to first did not have a current MOT, It is not being used. I see the 75 to Padstow had a route and timetable change after the first day. In Padstow now only serves Sarah's Lane inbound leaving direct on to the main road. The time saving goes into extra time thru Bodmin. Come April 12th it could work through to Plymouth on service 11 on the journeys not going to/from Polperro as 73s.